Except mine was a Mac 512K (without the e) mislabeled by the PC types at the store, so I got one that couldn’t. I had to take it back and get a replacement. Two years later, I strapped myself to a wall outlet, used my Torx driver to loosen the screws – oooh, we weren’t supposed to do that — and put in a 1 MB memory chip to replace the half-Megabyte that the computer came with. I was so proud. Add to that a 20 MB external hard drive and a 2400 baud (!) modem, and I was set. I still have the original 512Ke startup disks! 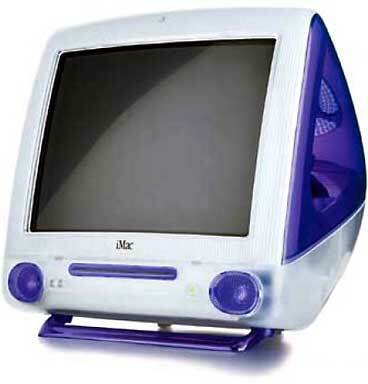 Yesterday, I just bought my fifth Mac – a grape iMac DV with 128 MB memory and a DVD drive. Incredible, but still not quite the same as downloading from a bulletin board just so the computer could use more than five fonts.